Outdoor media acquisition and media/Live event coverage – PLANETCAST has pioneered the concept of outdoor media delivery via satellite in India. It is a leading provider of DSNG & Occasional Use services for News, Sports & special events in SD and HD having developed our expertise with creative solutions with number of years of experience. Maximizing our strategic location within Asia, the content can be delivered to every corner of the world. PLANETCAST has pioneered the concept of outdoor media delivery via satellite in India. It is a leading provider of DSNG Services & Occasional Use services for News, Sports & special events in SD and HD having developed our expertise with creative solutions with number of years of experience. Maximizing our strategic location within Asia, the content can be delivered to every corner of the world. We offer DSNG Services and Occasional services which are flexible, efficient and cost effective. 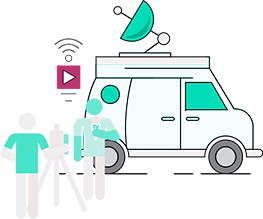 To offer these services effectively PLANETCAST maintains the largest fleet of mobile Uplinking kits & vehicles on SD, HD, 3D platforms, operating on C &Ku band to bring big ticket events (sports, political, cultural, etc) live to TV viewers. In addition to the above, we also lease out our fleet on long term basis to news channels. We also design, integrate and supply customized OB / DSNG vans for our customers. Live 2-Way links through onboard receivers for coordination etc. Encryption Options: – BISS, RAS and any other customer required encryption. Antenna Size : 1.2 Mtr. – 3.8 Mtr. Sound, experienced & internationally accredited technical manpower to cater all kind of transmission requirements.